We need to protect existing cycle routes from industrial development and increasing traffic levels if they are to stay safe and be successful. 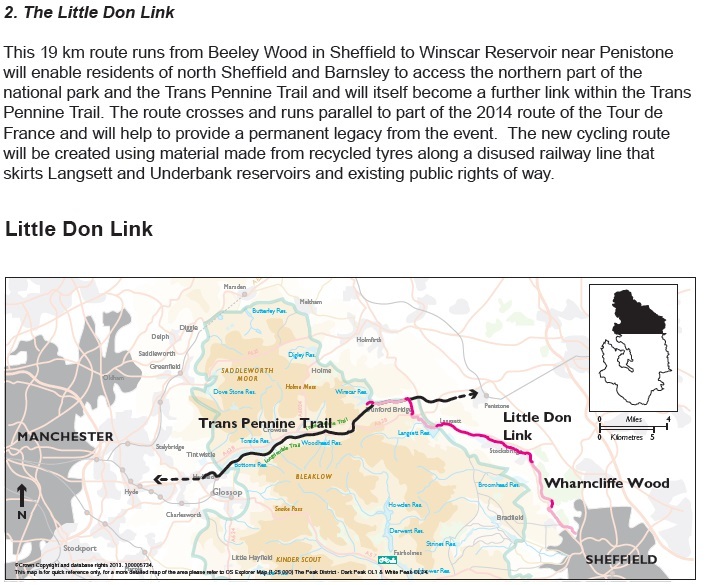 Problems with planning on the Sheaf Valley route have recently come to light, NCN627 could be the next cycle route under threat from conflicting planning policies. Big investment in Peak District National Parks cycling funding could be wasted if we get this wrong. Clay Wheels Lane and Beeley Wood Lane form part of the National Cycle Network route 627. The section through Clay Wheels Lane is earmarked for industrial development. There is already a new Sainbury’s Supermarket which provides sub-standard cycle facilities and there is an application to double the size of a local recycling depot (13/02199/FUL) which will double of the number of HGVs to the site which use the National Cycle Network road. 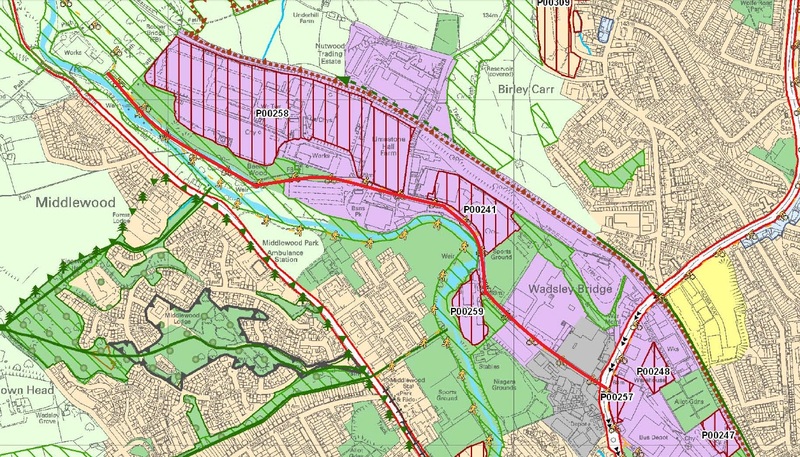 The local plan proposals map show this whole area is a priority industrial development site, the lilac colour indicates a “Business Industrial Area”. Sites P00258, P00241 and P00259 are priority sites identified for development of “research and development, light industry and general industry” businesses. Link to online map. These sites are right next to the National Cycle Network. The map does show that Beeley Wood Road/Clay Wheels Lane cycling route needs improvement however we need to significantly improve upon the standards demonstrated in recent local developments to offset the harm from increased industrial development. The Sheffield Planning Core Strategy includes a policy actively promoting this area for industrial and business uses as well as increasing volumes of traffic by building a new bridge across the river Don from Middlewood Road. Employment uses will be maintained and promoted in the Wadsley Bridge areas, including improvements to access and the local environment. Industrial and business uses will be promoted in the Upper Don Valley with significant access improvements including bridging the River Don from Middlewood Road. A bridge over the River Don from Middlewood Road would greatly improve the presently poor access, open up jobs to people living in Stocksbridge and also help to relieve congestion in other parts of the Valley. We should push for improvements to this section of the route before more development to keep cycling safe and safeguard this National Cycle Network route. This entry was posted in Uncategorized on September 10, 2013 by Matt.